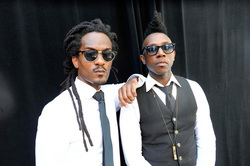 Deep Cotton is an American funk duo based in Atlanta, whose members are Chuck Lightning and Nate "Rocket" Wonder. The band got its start at OUTLANDIA, a communal farmstead in rural Georgia. What is obvious is that they have been quite active in the Atlanta music scene—first, along with their illustrious partner in crime, Janelle Monáe, they founded an arts collective named the Wondaland Arts Society. It’s not a surprise that this duo joined the punk rock motorcycle gang known as the Rolling Bones.